We welcomed 70,000 people last year with visitors saying, “The BIG on Bloor Festival was an exceptional experience with so much to see, do and really be engaged with.” This year we are in full swing to surprise and delight you again with event to enjoy and participate in. July 20/ 21, 2013 car-free Bloor St., Toronto, Dufferin to Lansdowne, celebrates arts, culture, community & small business with a unique community and city-building festival featuring hundreds of events, activities and exhibitions including: Bloordale Market: more than 200 arts, crafts, vendors and information tables! BIG on Bloor 2013 leading events: Celebrate Here: Music, performance and dance! Culture Works: Institutions, collectives, artists creative events… see, touch, learn, participate! Savour Bloor: In the stores, restaurants, patios and the Bloodale Food Court! Big Awards: Community appreciation! 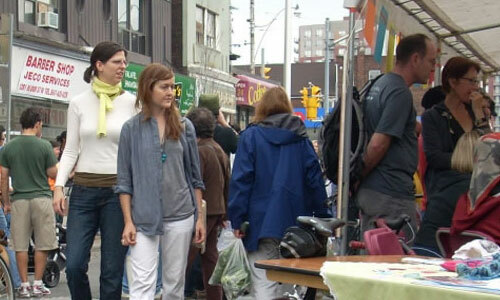 Play Fair: Games for children and adults and the Bloordale Market! The BIG On Bloor Festival an initiative of the Bloordale BIA, BIG: Bloor Improvement Group and the Bloordale community.